A G Brockman is Kent’s longest-running organic farm. It’s a family farm of around 200 acres lying in a valley of the North Downs between the villages of Chartham and Garlinge Green. Traditional crop rotation is used for fertility building as well as weed, pest and disease control. The land has now been free of pesticides, herbicides and fungicides for up to five decades, during this period the soils have improved, showing higher organic matter levels as well as increased biological activity and improved soil structure. Crop yields have also increased over this period. The farm practices biodynamic farming and places great importance on breed and variety selection for quality and taste. Please note: this is not to be confused with the non-organic Perry Court Farm nearby that produces apple crisps. A successful farm in Kent, Ripple Farm were certified organic 20 years ago and they supply a variety of box schemes, farmers’ markets, shops, cafes and restaurants with the excellent quality organic food they grow. 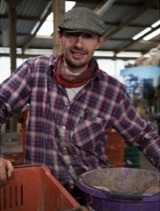 Pictured here is Martin, the farm’s organic food grower. 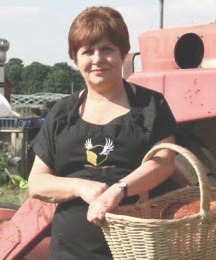 Our bread is made by our local Bread Angel Gaye Whitwam who bakes out of her home kitchen. For more information on our bread, head to our dedicated bread page, which breaks down what Gaye puts into our bread, why and where it comes from. As well as growing their own organic food, Brockman’s also wholesale organic food under the guise of Perry Court. They source fruit, vegetables, herbs and other produce from other farms in the UK. We source our biodynamic eggs from them – which come from Orchard Eggs in Forest Row.